Fish has always had a reputation as "brain food," largely because of the DHA and EPA it contains. But it isn't just infants and children who benefit from the omega-3 fatty acids in fish. These two compounds support brain function throughout life. The human brain is more than 60 percent structural fat. For brain cells to function properly, this structural fat needs to be composed primarily of omega-3 fats and phospholipids. Cell membranes are the gatekeepers of the cell. Anything that wants to get into or out of a cell must pass through the cell's outer membrane. Omega-3 fatty acids, which are especially fluid and flexible, make this process easier, maximizing the cell's ability to usher in nutrients while eliminating wastes. All of us have "senior moments" as we get older. We forget where we left the car keys or walk into a room and wonder why we are there. Age-related memory loss is considered a normal part of getting older. But making sure your brain has the nutrients it needs namely omega-3 fatty acids may keep you sharp well into old age. For years, scientists believed that neurons, the nerve cells that do the brain's work, could only be lost with age, not regenerated. But there is some evidence that new nerve cells can be created deep in the center of the brain. Once reborn, they move to other areas of the brain, including the parts associated with higher mental functions. But for all of this to happen, these neurons need to be nourished with EFAs. DHA increases the amount of phosphatidylserine (PS), an essential fatty acid that makes up part of the brain cell membrane. A number of double-blind trials have validated the ability of PS to improve memory, learning, concentration, word recall, and mood in both middle-aged and elderly subjects with age-related cognitive dysfunction. Research in the American Journal of Clinical Nutrition suggests that DHA may also improve cognitive function and memory by suppressing inflam-mation and oxidative damage in the brain. In one study, investigators gathered childhood IQ data for seniors who were tested in 1947 and tested them again in 2000 and 2001. They also looked at the participants' diet, supplement use, and current plasma levels of omega-3s. The researchers found that those who took fish oil supplements had better cognitive func-tion than those who did not. According to the researchers, the omega-3s in fish oil help to preserve cognitive thinking and mental processing by reducing inflammation in the brain. No matter what the mechanism, it is clear that omega-3 fatty acids help keep the brain in top form as we age. From the scientific investigations in the Netherlands to the famous Framingham Study, researchers have shown that people over age 50 with high levels of omega-3 fats circulating in their blood not only experience less memory loss, but they show 60 percent to 70 percent less decline in speed-related cognitive function than people with lower DHA and EPA blood levels. In vitro tests with DHA conducted by three world-renowned French re-searchers Jaques Fanni, Michael Linder, and Michael Parmentier show an increase in the number and quality of connections between human neurons. What's more, research in the Journal of Neurochemistry shows that DHA protects the neurons from protein toxicity a benefit that may come from the phospholipids naturally present in this omega-3 fatty acid. When the brain's neurons can easily "talk" to each other, cognitive function is enhanced. This was shown in an unpublished clinical trial of healthy people taking Vectomega. Nearly all of the participants reported better cognitive function and quality of sleep. Fifty percent of the subjects reported improvements in long-term memory, while 76 percent reported improvements in short-term memory. Sixty-nine percent noted better mental vivacity, and concentration levels were reported to have improved in 77 percent of the participants. There was also a reduction in agitation and visual fatigue. Besides omega-3s cognition-boosting benefits, the phospholipids in vectorized fish oil especially phosphatidylcholine and phosphatidylser-ine help protect neurons and prevent the free-radical damage that can negatively impact brain function. One of the greatest fears of growing older is the possibility of developing Alzheimer's disease. Currently, more than 5 million Americans are suffer-ing from this mind-stealing condition a 10 percent increase since 2002. Scientists predict that number will grow to 7.7 million by 2030 and 16 mil-lion by 2050. And it isn't just affecting people over 65. Between 200,000 and 500,000 people under age 65 are struck by early-onset Alzheimer's. Conventional medicine is helpless in the face of Alzheimer's there is no effective cure for the disease. People afflicted with Alzheimer's gradu-ally lose their cognitive ability as their brain cells are attacked and de-stroyed. In the end stages of the disease, patients become completely dis-oriented and must rely on caregivers for even their most basic functions. Omega-3 fatty acids, however, may have a protective effect against the ravages of Alzheimer's. It has been shown that DHA helps guard against the accumulation of tau, a protein involved in the development of neu-rofibrillary tangles. It also decreases beta amyloid formation by reducing levels of presenilin, the enzyme that separates beta amyloid from its par-ent protein. Neurofibrillary tangles and beta amyloid plaques are the two types of brain lesions found in the brains of Alzheimer's patients. DHA also attacks beta-amyloid plaques on another front. Researchers at the University of California, Los Angeles, found that this omega-3 boosts the production of LR11, a protein in the brain that destroys the plaques. Reduced levels of LR11 increase beta-amyloid production and may be a significant genetic cause of late-onset Alzheimer's disease. The UCLA team also discovered that even low doses of DHA increased the levels of LR11. In one study of DHA's impact on Alzheimer's disease, which was pub-lished in the Journal of Neuroscience, nerve cells from rats were pretreated with the supplement for 48 hours before being exposed to amyloid-beta peptides. DHA not only protected the neurons, but it also significantly in-creased their survival. While much more research needs to be done, these findings suggest that DHA may play an important role in preventing or slowing the neurodegeneration seen in patients with Alzheimer's disease. EPA may offer some protection against Alzheimer's and other forms of dementia, too. The American Journal of Clinical Nutrition recently pub-lished an investigation of more than 1,200 French seniors, which found that those with high levels of EPA circulating in their bloodstream had a 31 percent lower incidence of dementia. The credit may go to EPA's anti-clotting and anti-inflammatory actions, which promote a healthy blood supply to the brain and lowers inflammation. Along with boosting your brain power, fish oil may improve your mood and might also play a role in treating depression and other mental disor-ders. A growing number of studies suggest a link between a higher inci-dence of depression and decreased omega-3 consumption. Depression is on the rise, with one in 18 adults suffering from some form of the blues. It's even more prevalent among those over 65. Recent data from the National Institutes of Mental Health show that 13 percent to 27 percent of older adults have subclinical depression. A number of epidemiological studies have also reported that 2.5 percent of children and more than eight percent of U.S. teens suffer from depression. Dr. Joseph Hibbeln, MD, a psychiatrist at the National Institutes of Health, believes that the reason for the increase in depression can be di-rectly attributed to a major shift in the way we eat especially when it comes to the fats we consume. He points out that the vast increase in the use of soy, corn, palm, and cottonseed oils in the last 100 years has totally changed the traditional ratio of omega-6 to omega-3 fatty acids in the diet. Soy oil consumption in the U.S., for example, has increased a thou-sandfold in the last 100 years, helping to skew the omega-6 to omega-3 ratio from about 1:1 to today's ratio of up to 20 times more omega-6s than omega-3s. To Dr. Hibbeln, this spells trouble. Because the brain consists almost entirely of fat, it makes sense that our dietary fat intake could affect brain composition. EPA improves blood flow and also affects hormones and the immune system, both of which have a direct effect on brain function. DHA is active in the membrane of ion channels in the brain, making it easier for them to change shape and transmit electrical signals. It is also involved in serotonin metabolism (re-duced serotonin production and/or activity is a key factor in depression). But when either of these omega-3 fatty acids is in short supply, the stage is set for mood disorders, including depression. When researchers from Ohio State University evaluated blood samples taken from 43 older adults, they found that the study participants with high ratios of omega-6 to omega-3 not only had higher levels of inflam-matory compounds, but they were also more likely to suffer from depres-sion. Both depression and stress promote the production of pro-inflam-matory cytokines. Researchers measured these compounds, and then the symptoms of depression were assessed using the Center for Epidemio-logical Studies Depression Scale. Levels of pro-inflammatory cytokines increased progressively as depressive symptoms increased. But when de-pressive symptoms were combined with high omega-6-to-omega-3 ratios, the levels of pro-inflammatory cytokines skyrocketed by up to 40 percent more than normal far beyond the 18 percent increase resulting from the presence of depressive symptoms alone. Low levels of DHA and EPA may also be involved in postpartum depres-sion, as evidenced by the higher incidence of this condition in countries with a lower level of fish consumption. This makes sense when we con-sider that omega-3 fatty acids are particularly important during pregnancy and in the first few years of a child's life, when the brain is developing very rapidly. If the mother doesn't get enough fatty acids while pregnant, she may find her supplies depleted as they are transferred to the baby. Several studies seem to bear this out. Mothers with postpartum depres-sion tend to be deficient in both EPA and DHA. Other studies have found that women with an adequate intake of DHA (from seafood or supple-ments) tend to be less likely to develop postpartum depression. Based on these observations, researchers at the University of Arizona Medical School decided to see if fish oil supplementation would diminish the "baby blues." Their small eight-week pilot study found that those women who took a combined DHA and EPA supplement experienced significant improvement in their symptoms. Other trials have also observed a marked improvement in depressed patients given DHA and EPA. In one trial, 69 percent of depressed patients who had not been helped by Prozac showed improvement after 12 weeks of omega-3 fatty acid supplementation. There is also mounting evidence that omega-3 fatty acids help manage another form of depression bipo-lar disease. Some trials show a 50 percent decline in episodes of mania or depression in bipolar patients taking a fish oil supplement. 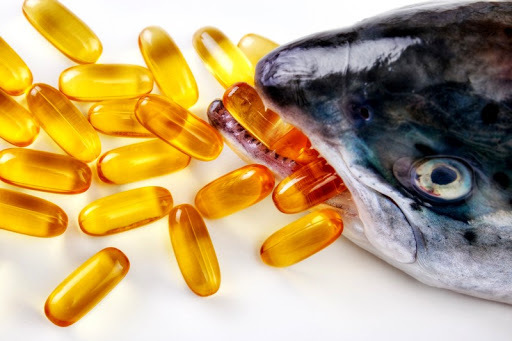 Because of fish oil's ability to improve mood and behavior, British au-thorities plan to give prisoners nutritional supplements, including a fish oil supplement. This follows a study showing that essential-fatty-acid sup-plements lessened antisocial behavior among 18- to 21-year-old prisoners by 37 percent. Supplemental omega-3 fatty acids also benefit children with attention deficit/hyperactivity disorder, dyslexia, and aggression. A Purdue Univer-sity study found that kids low in omega-3 essential fatty acids are sig-nificantly more likely to be hyperactive, have learning disorders, and to display behavioral problems. In the Purdue study, a greater number of be-havioral problems. temper tantrums, and sleep problems were reported in children with lower total omega-3 fatty acid concentrations. More learn-ing and health problems were also found in the children with lower total omega-3 fatty acid concentrations. There is also some preliminary evidence that giving omega-3 fatty acid supplements to children with autism can reduce tantrums and aggressive behavior. Although more research needs to be done, these studies may give parents a safe and simple way to help their children with ADHD, learning difficulties, or possibly even autism to function at a higher level both socially and in the school environment.